LONDON -- Flights in and out of London City Airport were disrupted Tuesday morning by a small group of protesters who managed to get onto its single runway and lock themselves together around a large tripod structure. The protesters, of Black Lives Matter U.K., were trying to raise awareness of what they says is the disproportionate impact man-made climate change has on minorities. The incident ended after about six hours, when police arrested nine people on suspicion of aggravated trespass, “being unlawfully airside,” and breaching airport bylaws. 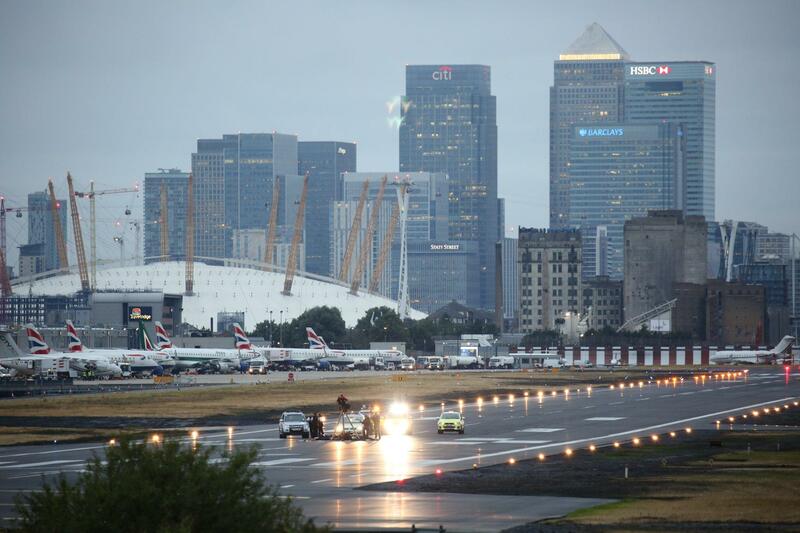 The police statement said only that the protesters had “made their way airside at London City Airport,” without explaining how they had reached the runway at the small airport which sits just to the east of London’s teeming financial district along the River Thames. British authorities are likely to face serious questions about the security breach. It was not immediately clear how the Black Lives Matter U.K. protesters managed to access the runway, which is flanked on the north and south by a marina in the Thames, and there were claims on social media they had accessed it from the water. The airport is used most heavily by business travelers, and is not as large or heavily trafficked as the British capital’s primary air hub, Heathrow, west of London. Climate Crisis is a Racist Crisis! City Airport was bought early in 2016 by a Canada-based investment consortium known by the acronym AIMCo. The airport’s local management said on its Twitter feed only that disruptions were continuing due to the protest, and apologized to affected passengers. Meanwhile, British Airways, which does have flights in and out of City Airport, was also experiencing a computer glitch on Tuesday that was causing reported delays for travelers from London to California. BA told the Reuters news agency passengers were being checked in at Heathrow and Gatwick Airport, south of London, with delays. The airline did not comment on social media reports of major delays checking in at airports in the U.S., including San Francisco and Washington D.C.’s Dulles International.